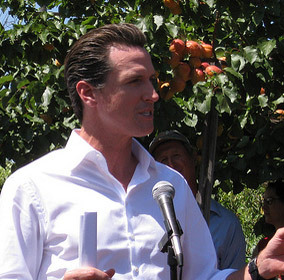 Gavin Newsom makes a number of announcements, so you may have missed the one he made last July at City Slicker Farm in Oakland. That day, to the excitement of many in the food world, Newsom announced an Executive Directive for healthy and sustainable food in San Francisco. Also key is the fact that the directive takes a whole system approach, rather than seeing food through a single lens, such as hunger or environmental impact or health. The detailed directive is based in part on recommendations made at last year’s Urban-Rural Roundtable; the Roundtable brought together food and agriculture leaders from around the Bay Area, including CUESA’s own executive director Dave Stockdale. This is the area of the directive that has received the most attention in the media, and for good reason: Americans everywhere are fired up about producing their own food. All departments with jurisdiction over public property are being asked to take stock, through an audit, of all land that might be suitable for growing food. In some cases, said Alemany Farm’s Antonio Roman-Alcalá, departments might already have land they know could be farmed. Roman-Alcalá described being approached by the San Francisco Airport about a tract of land they are interested in leasing at a nominal rate to a local farmer, for example. The directive also asks that the Department of Recreation and Parks support more urban ag projects by facilitating access to gardening materials and tools, organizing community events and connecting volunteers to opportunities to get their hands in the dirt. Since food access is a growing issue in San Francisco (there are currently 193 food pantries in the city), the directive also has a heavy focus on eliminating hunger. Efforts to give residents access to food stamps will be beefed up in several ways, and the Redevelopment Agency will be asked to “identify strategies, such as enterprise zones, permit expediting, tax incentives, etc. to recruit and incubate new food businesses,” e.g. grocery stores, in areas where the only nearby sources of food are often convenience stores or liquor stores. Not only will the City put healthier food in its vending machines, it will also get involved in work to increase funding to the School Meals Program (although the City does not have any actual jurisdiction over San Francisco Unified School District). The encouraging news, says Jones, is that 46 city departments have already turned in draft proposals examining ways they can prioritize healthy and sustainable food. The challenge, she acknowledged on Tuesday, is that the directive comes with no new funding, meaning city departments must find creative ways to comply at a time when many are already strapped for basic funds. Don’t know who your district supervisor is? Here’s a handy map that includes contact information.